Since the natural and chemical-free bubble bath soaps in stores costed us $10-12 per bottle and even the "safest" ones had some preservatives and sulfates, I decided it'd be an all around better option to just make homemade bubble bath. A truly chemical free bubble bath doesn't get as "bubbly" as, let's say, Johnson & Johnson does. But that's only because the chemicals that make the bubbles like that are toxic. I'd rather have a toxic-free, less-bubbly bath. 1 C Dr. Bronner's Castile Soap (I use lavender, but they have other scents. The almond one is my other favorite). If you have a newborn and are afraid of soap getting in baby's eyes, they have a baby mild version, too. That's it! Mix them together and put in a reusable container, like a mason jar. 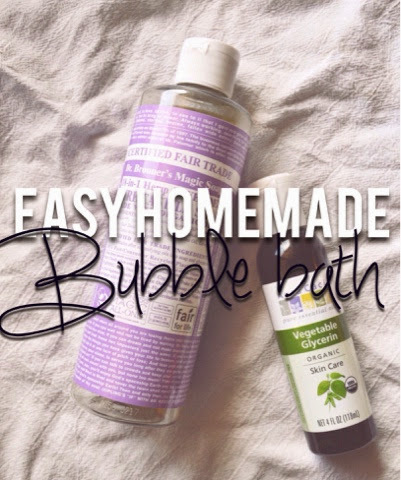 *Pro tip: If you have an empty bottle of California Baby or Honest co. bath bubbles this recipe fits perfectly in one of them.